Why FV Class? It is the purest form of open wheel racing in the world. You must be inch perfect and can not “muscle” the car to gain performance. Everything is dependent on your ability to be smooth, precise and patient to extract the most out of these cars. Now add 25 more drivers all trying to do the same thing in the same space you are currently occupying…that’’s why Formula Vee/Formula 1200! Accomplishments First Karting Championship in 1980 (NHKA Sprint Sit-Up), Over 100 Karting podiums including 3 Regional, 4 National and 1 International Championship. Moved to Budweiser/Truesports Indycar team and worked in their Motorsports Equipment and Koni sales and service division. In addition, drove under the Budweiser/Truesports banner in the Pro Sports 2000, F2000 and Formula Atlantic Championships. 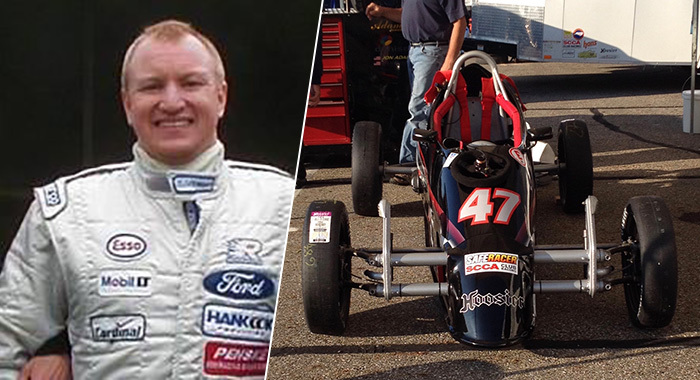 Over 75 Auto Racing podiums including wins with IMSA, USAC, SCCA and CASC. Active today in Vintage racing. Currently competing in Vintage Circle Track racing with the Senior Tour Auto Racing series. 10 podiums in 10 events, including 6 wins.